Bullard goes on to talk about the labour market and talk about low oil prices is helpful for the US economy. It all very much sounds like Bullard has made up his decision BEFORE he has looked at any data. In fact it is hard to see what monetary policy rule Bullard is advocating and he seems to be cherry picking data to make an argument for rate hike. It is frankly speaking not very impressive. But why doesn’t Bullard just look at nominal GDP? After all back in May he co-authored a Working Paper in which he essentially argued that the Federal Reserve should to target nominal GDP! NGDP has since mid-2009 essentially been on a straight line growing on average slightly less than 4% a year and in Q2 2015 was slightly below this trend. Why doesn’t Bullard just acknowledge that? He should be happy – the Fed is doing what he said it should be doing. But of course that would mean that there would not be any arguments for hiking interest rates. After all prediction markets (such as Hypermind) presently are forecasting around 3.5% NGDP growth for all of 2015 and in that sense the Fed is slightly undershooting it’s post-2009 de fact NGDP rule. Jim, I was very happy to see you advocated NGDP targeting back in May – why have you already changed your mind?? PS Bullard talks about interest rates being at “emergency” setting. I guess Bullard has forgot what Milton Friedman told us about why low interest rates. Jim, interest rates are low because monetary policy has been tight. If you want to hear me speak about these topics or other related topics don’t hesitate to contact my speaker agency Specialist Speakers – e-mail: roz@specialistspeakers.com. For US readers note that I will be “touring” the US in the end of October. It is the same thing every month – anybody seriously interested in financial markets and the global economy are sitting and waiting for the US labour market report to come out even though the numbers are notoriously unstable and unreliable. Why is that? The simple answer is that it is not because the numbers are important on their own, but because the Federal Reserve seems to think the labor market report is very important. And that particularly goes for Fed-chair Janet Yellen who doesn’t seem to miss any opportunity to talk about labour market conditions. To Janet Yellen changes in inflation seems to be determined by the amount of slack in the US labour market and if labour market conditions tighten then inflation will rise. This of course is essentially an old-school Phillips curve relationship and a relationship where causality runs from labour market conditions to wage growth and on to inflation. This means that for the Yellen-fed labour market indicators essentially are as important as they were for former Fed chairman Arthur Burns in the 1970s and that could turn into a real problem for US monetary policy going forward. To understand this we need to go back to Milton Friedman’s now famous presidential address delivered at the Eightieth Annual Meeting of the American Economic Association – “The Role of Monetary Policy” – in 1967 in, which he explained what monetary policy can and cannot do. What if the monetary authority chose the “natural” rate – either of interest or unemployment – as its target? One problem is that it cannot know what the “natural” rate is. Unfortunately, we have as yet devised no method to estimate accurately and readily the natural rate of either interest or unemployment. And the natural rate will itself change from time to time. But the basic problem is that even if the monetary authority knew the natural rate, and attempted to peg the market rate at that level, it would not be led to determinate policy. The “market” rate will vary from the natural rate for all sorts of reasons other than monetary policy. If the monetary authority responds to these variations, it will set in train longer term effects that will make any monetary growth path it follows ultimately consistent with the policy rule. The actual course of monetary growth will be analogous to a random walk, buffeted this way and that by the forces that produce temporary departures of the market rate from the natural rate. To state this conclusion differently, there is always a temporary trade-off between inflation and unemployment: there is no permanent trade-off. The temporary trade-off comes not from inflation per se, but from unanticipated inflation which generally means, from a rising rate of inflation. The widespread belief that there is a permanent trade-off is a sophisticated version of the confusion between “high” and “rising” that we all recognize in simpler forms. A rising rate of inflation may reduce unemployment, a high rate will not. …To state the general conclusion still differently, the monetary authority controls nominal quantities – directly, the quantity of its own liabilities. In principle, it can use this control to peg a nominal quantity – an exchange rate, the price level, the nominal level of income, the quantity of money by one or another definition – or to peg the rate of change in a nominal quantity – the rate of inflation or deflation, the rate of growth or decline in nominal national income, the rate of growth of the quantity of money. It cannot use its controls over nominal quantities to peg a real quantity – the real rate of interest, the rate of unemployment, the level of real national income, the real quantity of money, the rate of growth of real income, or the rate of growth of the real quantity of money. Central banks temporary can impact real variables such as unemployment or real GDP, but it cannot permanently impact these variables. Similarly there might be a short-term correlation between real variables and nominal variables such as a correlation between nominal wage growth (or inflation) and unemployment (or the output gap). However, inflation or the growth of nominal income is not determined by real factors in the longer-term (and maybe not even in the short-term), but rather than by monetary factors – the balance between demand and supply of money. The Yellen-fed seems to be questioning Friedman’s fundamental insight. Instead the Yellen-Fed seems to think of inflation/deflation as a result of the amount of “slack” in the economy and the Yellen-fed is therefore preoccupied with measuring this “slack” and this is what now seems to be leading Yellen & Co. to conclude it is time to tighten US monetary conditions. This is of course the Phillips curve interpretation of the US economy – there has been steady job growth and unemployment is low so inflation most be set to rise no matter what nominal variables are indicating and not matter what market expectations are. Therefore, Yellen (likely) has concluded that a rate hike soon is warranted in the US. This certainly is unfortunately. Instead of focusing on the labour market Janet Yellen should instead pay a lot more attention to the development in nominal variables and to the expectations about these variables. What are nominal variable telling us? Friedman mentions a number of variables that the monetary authorities directly or indirectly can control – among others the price level, the level of nominal income and the money supply. We could add to that nominal wages. So what are these variables then telling us about the US economy and the state of monetary policy? Lets take them one-by-one. We start with the price level – based on core PCE deflator. The graph shows that it looks as if the Federal Reserve has had a price level target since the (“official”) end of the 2008-9 recession in the summer of 2009. 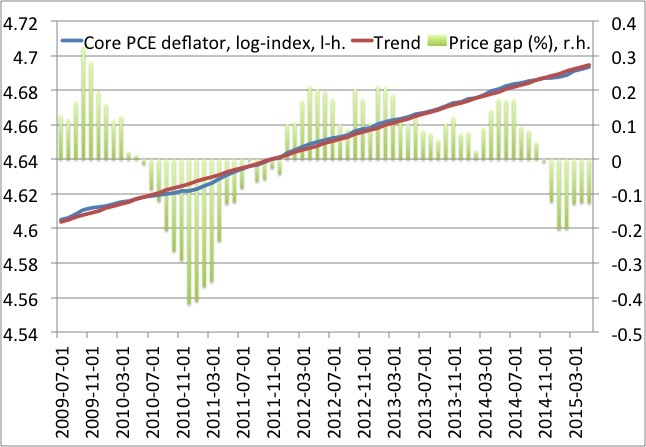 In fact at no time since 2009 has the actual price level (PCE core deflator) diverged more than 0.5% from the trend. Interestingly, however, the trend growth rate of the price level has been nearly exactly 1.5% – pretty much in line with medium-term market expectations for inflation, but below the Fed’s official 2% inflation target. However, if we define the Fed’s actual target as the trend in the price level over the past 5-6 years then there is no indication that monetary policy should be tightened. In fact the actual price level has this year fallen slightly below the 1.5%-“target path” indicating if anything that monetary conditions is slightly too tight (but nearly perfect). Obviously if we want to hit a new 2% path then someeasing of monetary conditions is warranted. So how about the favorite Market Monetarist-indicator – Nominal GDP? Again the picture is the same – the Fed has actually delivered a remarkable level of nominal stability since the summer of 2009. 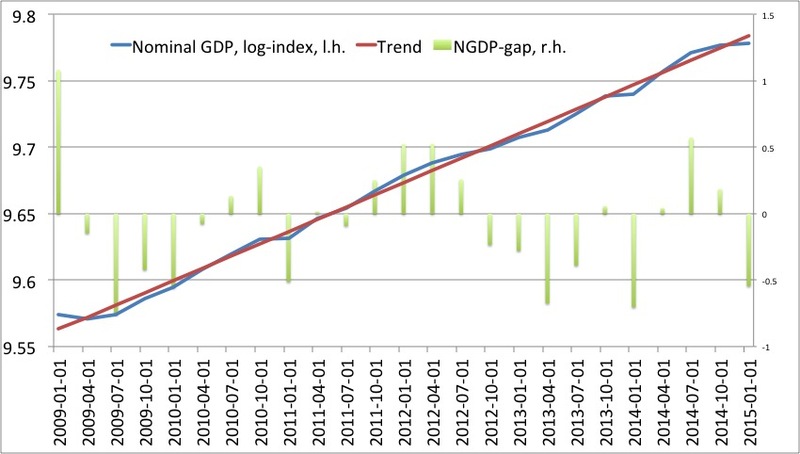 Hence, nominal GDP has grown nicely along at a trend since Q3 2009 and the actual NGDP level has remains remarkably close to the trend path for NGDP – as if the Fed was actually targeting the NGDP level along a (close to) 4% path. And as with the price level – the present NGDP level is slightly below the trend over the past 5-6 years indicating a slightly too tight monetary stance. Furthermore, it should be noted that prediction markets such as Hypermind presently are predicting around 3.5% NGDP growth in 2015 – below the 4% de facto target. So again if anything US monetary policy is – judging from NGDP and NGDP expectations – just a tiny bit too tight. And what about Milton Friedman’s favourite nominal indicator – the broad money supply? Here we look at M2. 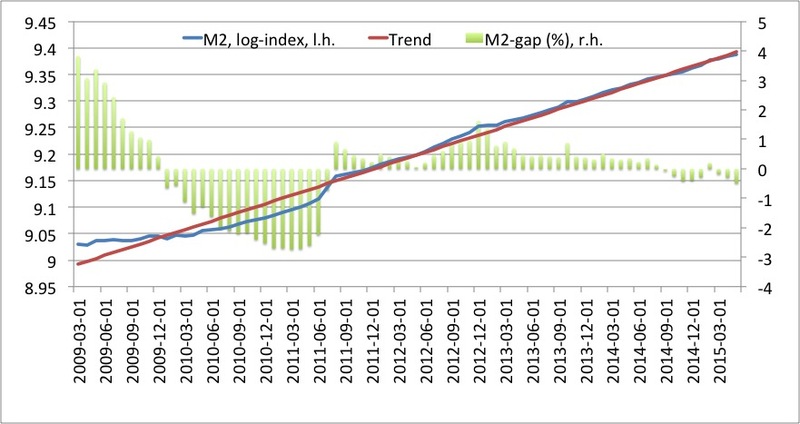 Once again we have seen a remarkable amount of nominal stability judging from the development in US M2 – particularly since 2011 with only tiny deviations in the level of M2 from the post-2009 trend. Milton Friedman undoubtedly would have praised the Fed for this. Hence, it looks as if the Fed actually have had a 7% growth path target for M2. But again, recently – as is the case with the price level and NGDP – the actual money supply (M2) as dropped moderately below the the post-2009 trend indicating that monetary conditions are slightly too tight rather than too easy. Then what about nominal wages? We here look at average hourly earnings for all all employees (total private). Surprise, surprise – again incredible nominal stability in the sense that average hourly earnings have grown very close to a near-perfect 2% trend in the past 5-6 years. 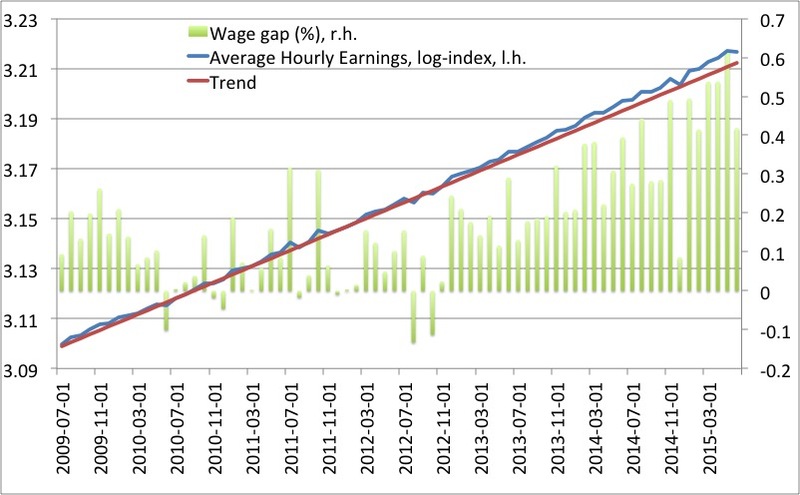 However, unlike the other nominal measures recently the “wage gap” – the difference between actual nominal wages and the trend – has turned slightly positive indicating that monetary conditions is a bit too easy to achieve 2% trend growth in US nominal wages. But again we are very, very close to the post-2009 trend. We could of course also notice that a 2% nominal wage growth target is unlikely to be comparable to a 2% inflation target if we have positive productivity growth in the US economy. The message from Milton Friedman is clear – we should not judge monetary conditions on real variables such as labour market conditions. Instead we should focus on nominal variables. If we look at nominal variables – the price level, NGDP, the money supply and nominal wages – the conclusion is rather clear. The Fed has actually since 2009 delivered a remarkable level of nominal stability in terms of keeping nominal variables very close to the post-2009 trend. If we want to think about the Bernanke-Fed the Fed had one of the following targets: 1.5% core PCE level targeting, 4% NGDP level targeting, 7% M2-level targeting or 2% wage level targeting at least after the summer of 2009. However, the Yellen-Fed seems to be focusing on real variables – and particularly labour market variables – instead. This is apparently leading Janet Yellen to conclude that monetary conditions should be tightened. However, nominal variables are telling a different story – it seems like monetary conditions have become slightly too tight within the past 6-12 months and therefore the Fed needs to communicate that it will not hike interest rates in September if it wants to keep nominal variables on their post-2009 path. Obviously the Fed cannot necessarily hit more than one nominal variable at the time so the fact that it has kept at least four nominal variables on track in the past 5-6 years is quite remarkable. However, the Fed needs to chose one nominal target and particularly needs to give up the foolish focus on labour market conditions and instead fully commit to a nominal target. My preferred target would certainly be a 4% (or 5%) Nominal GDP level target. And Chair Yellen, please lay the Phillips curve to rest if you want to avoid sending the US economy into recession in 2016! PS My thinking on these issues has strongly be influence by my good friend Mike Darda. PPS think of the present time as one where Milton Friedman would be more dovish than Arthur Burns. If you ever read Friedman and Schwartz’s “A Monetary History of the United States” you know what happens when a central bank fails to act as a lender-of-last resort in the event of a bank run and/or at the same time fails to offset the impact on broad money growth of such bank run. It of course happened in the US in 1930-31 and again in Europe after the collapse of Credit-Anstalt in Austria also in 1931. In both cases the result was a deep depression. Now it has happened again in Greece, but Greece is already in a deep economic depression. Just have a look at this shocking graph from Macropolis.gr. 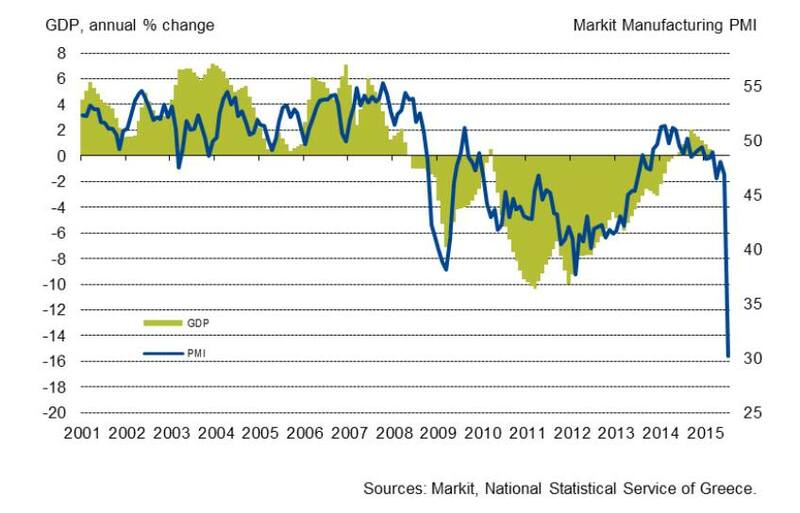 There is no great reason to trust eyeball-econometrics, but judging from the sharp drop in Greek July PMI (released today) then we should expect another 10-15% drop in Greek real GDP in the next couple of quarters. That would mean that we soon will have seen Greek real GDP being halved since the start of this crisis. I think it will be very hard to find any other example of a (peacetime) collapse of real GDP of this magnitude in any other country in the world in the past 200 years and there is nothing positive to say about this. It is the terrible consequence of massive policy failures in Brussels, Frankfurt, Berlin and Athens. If you want to hear me speak about these topics or other related topics don’t hesitate to contact my speaker agency Specialist Speakers – e-mail: roz@specialistspeakers.com. Also note that I am on a Speaking Tour in the US in October. See more here. Imagine that the euro had never been introduced and we instead had had freely floating European currencies and each country would have been free to choose their own monetary policy and fiscal policy. Some countries would have been doing well; others would have been doing bad, but do you seriously think that we would had a crisis as deep as what we have seen over the past seven years in Europe? Do you think Greek GDP would have dropped 30%? Do you think Finland would have seen a bigger accumulated drop in GDP than during the Great Depression and during the banking crisis of 1990s? Do you think that Europe would have been as disunited as we are seeing it now? Do you think we would have seen the kind of hostilities among European nations as we are seeing now? Do you think we would have seen the rise of political parties like Golden Dawn and Syriza in Greece or Podemos in Spain? Do you think anti-immigrant sentiment and protectionist ideas would have been rising across Europe to the extent it has? Do you think that the European banking sector would have been quasi paralyzed for seven years? And most importantly do you think we would have had 23 million unemployed Europeans? The answer to all of these questions is NO! We would have been much better off without the euro. The euro is a major economic, financial, political and social fiasco. It is disgusting and I blame the politicians of Europe and the Eurocrats for this and I blame the economists who failed to speak out against the dangers of introducing the euro and instead gave their support to a project so economically insane that it only could have been envisioned by the type of people the British historian Paul Johnson called “Intellectuals”. And don’t say you where not warned. Milton Friedman had warned you that forced monetary integration would cause political disunity and would be an economic disaster. He was of course right. Bernard Connolly who wrote the book “The Rotten Heart of Europe” warned against exactly what is going on right now. Nobody wanted to listen. In fact Bernard Connolly was sacked from the European Commission in 1995 for speaking his mind. The sacking of Bernard Connolly unfortunate is telling of lack of debate about monetary policy matters in Europe. Any opposition to the “project” is silenced. The greater “good” always comes first. There have only been referendums about euro adoption in a few countries. In Denmark and Sweden the electorate have been wise enough to go against the “orders” of the euro establishment. As a consequence both countries today are better off than if the electorate had followed the orders of the elite and voted ‘yes’ to euro adoption. It is easy to understand the frustration of the European voters. They have been lied to. Unfortunately the outcome is that voters across Europe now are happy to vote for parties like Front Nation, UKIP, Podemos and Syriza. I ask you the cheerleaders of the euro project – is this what you wanted? I can only say that I can understand the Greek population’s anger over seven years of economic and social hardship and I likewise can understand that the taxpayers of Finland don’t want to pay for yet another meaningless bailout of Greece. But you should not blame each other. You should blame the European politicians who brought you into the euro. The euro is a fatal conceit. UPDATE: I now have some empirical evidence that the euro is indeed a Monetary Strangulation Mechanism. I have been a bit too busy to blog recently and at the moment I am enjoying a short Easter vacation with the family in the Christensen vacation home in Skåne (Southern Sweden), but just to remind you that I am still around I have a bit of stuff for you. Or rather there is quite a bit that I wanted to blog about, but which you will just get the links and some very short comments. Second, Ben Bernanke is blogging! That is very good news for those of us interested in monetary matters. Bernanke was/is a great monetary scholar and even though I often have been critical about the Federal Reserve’s conduct of monetary policy under his leadership I certainly look forward to following his blogging. If you asked the person in the street, “Why are interest rates so low?”, he or she would likely answer that the Fed is keeping them low. That’s true only in a very narrow sense. The Fed does, of course, set the benchmark nominal short-term interest rate. The Fed’s policies are also the primary determinant of inflation and inflation expectations over the longer term, and inflation trends affect interest rates, as the figure above shows. But what matters most for the economy is the real, or inflation-adjusted, interest rate (the market, or nominal, interest rate minus the inflation rate). The real interest rate is most relevant for capital investment decisions, for example. The Fed’s ability to affect real rates of return, especially longer-term real rates, is transitory and limited. Except in the short run, real interest rates are determined by a wide range of economic factors, including prospects for economic growth—not by the Fed. To understand why this is so, it helps to introduce the concept of the equilibrium real interest rate (sometimes called the Wicksellian interest rate, after the late-nineteenth- and early twentieth-century Swedish economist Knut Wicksell). The equilibrium interest rate is the real interest rate consistent with full employment of labor and capital resources, perhaps after some period of adjustment. Many factors affect the equilibrium rate, which can and does change over time. In a rapidly growing, dynamic economy, we would expect the equilibrium interest rate to be high, all else equal, reflecting the high prospective return on capital investments. In a slowly growing or recessionary economy, the equilibrium real rate is likely to be low, since investment opportunities are limited and relatively unprofitable. Government spending and taxation policies also affect the equilibrium real rate: Large deficits will tend to increase the equilibrium real rate (again, all else equal), because government borrowing diverts savings away from private investment. If the Fed wants to see full employment of capital and labor resources (which, of course, it does), then its task amounts to using its influence over market interest rates to push those rates toward levels consistent with the equilibrium rate, or—more realistically—its best estimate of the equilibrium rate, which is not directly observable. If the Fed were to try to keep market rates persistently too high, relative to the equilibrium rate, the economy would slow (perhaps falling into recession), because capital investments (and other long-lived purchases, like consumer durables) are unattractive when the cost of borrowing set by the Fed exceeds the potential return on those investments. Similarly, if the Fed were to push market rates too low, below the levels consistent with the equilibrium rate, the economy would eventually overheat, leading to inflation—also an unsustainable and undesirable situation. The bottom line is that the state of the economy, not the Fed, ultimately determines the real rate of return attainable by savers and investors. The Fed influences market rates but not in an unconstrained way; if it seeks a healthy economy, then it must try to push market rates toward levels consistent with the underlying equilibrium rate. It will be hard to find any self-described Market Monetarist that would disagree with Bernanke’s comments. In fact as Benjamin Cole rightly notes Bernanke comes close to sounding exactly as David Beckworth. Just take a look at these blog posts by David (here, here and here). So maybe Bernanke in future blog posts will come out even more directly advocating views that are similar to Market Monetarism and in this regard it would of course be extremely interesting to hear his views on Nominal GDP targeting. Some observers have argued that the Federal Reserve would best fulfi ll its mandate by adopting a target for nominal gross domestic product (GDP). Insights from the monetarist tradition suggest that nominal GDP targeting could be destabilizing. However, adopting benchmarks for both nominal and real GDP could offer useful information about when monetary policy is too tight or too loose. At the same time, articulation of a benchmark path for the level of nominal GDP would be a useful start in formulating and communicating policy as a rule. An explicit rule would in turn highlight the importance of shaping the expectations of markets about the way in which the central bank will behave in the future. A benchmark path for the level of nominal GDP would encourage the FOMC to articulate a strategy (rule) that it believes will keep its forecasts of nominal GDP aligned with its benchmark path. In recessions, nominal GDP growth declines significantly. During periods of inflation, it increases significantly. The FOMC would then need to address the source of these deviations. Did they arise as a consequence of powerful external shocks? Alternatively, did they arise as a consequence either of a poor strategy (rule) or from a departure from an optimal rule? That I believe is the closest Bob ever on paper has been to give his full endorsement of NGDP “targeting” – Now we just need Bernanke (and Yellen!) to tell us that he agrees. …yes, Friedman went further than Bob. Friedman had also become a market monetarist. He wanted to use the market not only to evaluate monetary policy, but also to implement monetary policy. Today Milton Friedman would have turned 102 years. Happy birthday Uncle Milty! I have over the last couple of years done numerous posts celebrating Milton Friedman so this post will not be long. Instead I will leave the job to Robert Hetzel who I am also celebrating this year as Bob turned 70 years on July 3. Milton Friedman began his teaching career at the University of Chicago isolated intellectually. He defended the ideas that competitive markets work efficiently to allocate resources and that central banks are responsible for inflation. By the 1980s, these ideas had become commonplace. Friedman was one of the great intellectuals of the 20th century because of his major influence on how a broad public understood the Depression, the Fed’s stop-go monetary policy of the 1970s, flexible exchange rates, and the ability of market forces to advance individual welfare. I my view Bob – with David Laidler and Edward Nelson – is one of the foremost Friedman scholars of the world. Friedman of course was Bob’s teacher and PhD thesis advisor at the University of Chicago. You might know the words, but do you get the music? 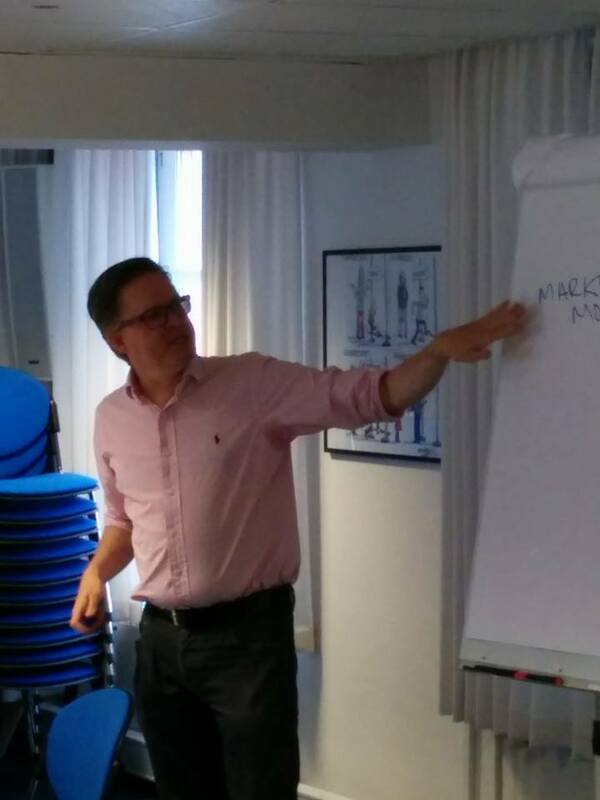 This morning I had the pleasure of doing a presentation on “Milton Friedman, Market Monetarism and the Great Recession” (and a bit on internet-Austrians) for a group of clever young students at the CEPOS Akademi in Copenhagen. CEPOS Akademi is essentially the Danish Free Market think tank CEPOS’s summer university. Obviously I had told the students that at the core of the euro crisis is monetary policy failure and that monetary policy in the euro zone remains deflationary and that the solution is quantitative easing within a rule-based framework – preferably nominal GDP targeting. I tried to answer the question as good as I could drawing Public Choice theory and “construction failure”, but as I was driving home in a taxi I opened a small pamphlet from the Institute of Economic Affairs that I had in my bag. In the pamphlet Money, Inflation and the Constitutional Position of the Central Bank an article by Milton Friedman – The Counter-Revolution in Monetary Theory – has been reprinted. On page 70 the answer to the student’s question popped up. As it happens, this interpretation of the depression was completely wrong. It turns out, as I shall point out more fully below, that on re-examination, the depression is a tragic testament to the effectiveness of monetary policy, not a demonstration of its impotence. But what mattered for the world of ideas was not what was true but what was believed to be true. And it was believed at the time that monetary policy had been tried and had been found wanting. In part that view reflected the natural tendency for the monetary authorities to blame other forces for the terrible economic events that were occurring. The people who run monetary policy are human beings, even as you and I, and a common human characteristic is that if anything bad happens it is somebody else’s fault. In the course of collaborating on a book on the monetary history of the United States, I had the dismal task of reading through 50 years of annual reports of the Federal Reserve Board. The only element that lightened that dreary task was the cyclical oscillation in the power attributed to monetary policy by the system. In good years the report would read ‘Thanks to the excellent monetary policy of the Federal Reserve…’ In bad years the report would read ‘Despite the excellent policy of the Federal Reserve…’, and it would go on to point out that monetary policy really was, after all, very weak and other forces so much stronger. The monetary authorities proclaimed that they were pursuing easy money policies when in fact they were not, and their protestations were largely accepted. This is of course the exact same discussion we are having today about the Great Recession. When in doubt – read Friedman. PS Friedman tells the same story in this Youtube video. PPS the head of the CEPOS Akademi and my friend Niels Westy took this picture of me during the “show” today. As I have promised earlier I will in the coming weeks write a number of blog posts on Robert Hetzel’s contribution to monetary thinking celebrating that he will turn 70 on July 3. Today I will tell the story about what I regard to be Bob’s greatest and most revolutionary idea. An idea which I think marks the birth of Market Monetarism. I should in that regard naturally say that Bob doesn’t talk about himself as market monetarist, but simply as a monetarist, but his ideas are at the centre of what in recent years has come to be known at Market Monetarism (I coined the phrase myself in 2011). “In February 1990, Richmond Fed President Robert Black testified before Congress on Representative Stephen Neal’s Joint Resolution 4009 mandating that the Fed achieved price stability with five years. Bob Black was a monetarist, and he recommend multiyear M2 targets. As an alternative, I had suggested Treasury issuance of matched-maturity securities half of which would be nominal and half indexed to the price level. The yield difference, which would measure expected inflation, would be a nominal anchor provided that the Fed committed to stabilizing it. Bob developed his idea further in a number of papers published in the early 1990s. See for example here and here. I remember when I first read about Bob’s idea I thought it was brilliant and was fast convinced that it would be much preferable to the traditional monetarist idea of money supply targeting. Milton Friedman obviously for decades advocated money supply targeting, but he also became convinced that Bob’s idea was preferable to his own idea. It was not only Friedman who liked Hetzel’s ideas. President Clinton’s assistant treasury secretary Larry Summers also liked the idea – or at least the idea about issuing bonds linked to inflation. This led the US Treasury to start issuing so-called Treasury Inflation Protected Securities (TIPS) in 1997. Since then a number of countries in the world have followed suit and issued their own inflation-linked bonds (popularly known as linkers). However, while Bob succeed in helping the process of issuing inflation-linked bonds in the US he was less successfully in convincing the Fed to actually use market expectations for inflation as a policy goal. In what we could call the strict version of Bob’s proposal the central bank would directly target the market’s inflation expectations so they always were for example 2%. This would be a currency board-style policy where monetary policy was fully automatic. Hence, if market expectations for, for example inflation two years ahead were below the 2% target then the central bank would automatically expand the money base – by for example buying TIPS, foreign currency, equities or gold for that matter. The central bank would continue to expand the money base until inflation expectations had moved back to 2%. The central bank would similarly reduce the money base if inflation expectations were higher than the targeted 2%. In this set-up monetary policy would fully live up to Friedman’s ideal of replacing the Fed with a “computer”. There would be absolutely no discretion in monetary policy. Everything would be fully rule based and automatic. In the soft version of Bob’s idea the central bank will not directly target market inflation expectations, but rather use the market expectations as an indicator for monetary policy. In this version the central bank would likely also use other indicators for monetary policy – for example money supply growth or surveys of professional forecasters. One can argue that this is what the Federal Reserve was actually doing from around 2000-3 to 2008. Another example of a central bank that de facto comes close to conducting monetary policy in way similar to what has been suggested by Hetzel is the Bank of Israel (and here there might have been a more or less direct influence through Bruno, but also through Stanley Fisher and other University of Chicago related Bank of Israel officials). Hence, for more than a decade the BoI has communicated very clearly in terms of de facto targeting market expectations for inflation and the result has been a remarkable degree of nominal stability (See here). Even in the soft version it is likely that the fact that the central bank openly is acknowledging market expectations as a key indicator for monetary policy will likely do a lot to provide nominal stability. This is in fact what happened in the US – and partly in other places during the 2000s – until everything when badly wrong in 2008 and inflation expectations were allowed to collapse (more on that below). It is useful when trying to understand the implications of Bob’s idea to target the market expectations for inflation to understand how the monetary transmission mechanism would work in such a set-up. As highlighted above thinking about fixed exchange rate regimes gave Bob the idea to target market inflation expectations, and fundamentally the transmission mechanism under both regimes are very similar. In both regimes both money demand and the money supply (both for the money base and broad money) become endogenous. Both money demand and the money supply will automatically adjust to always “hit” the nominal anchor – whether the exchange rate or inflation expectations. One thing that is interesting in my view is that both in a fixed exchange rate regime and in Bob’s proposal the actual implementation of the policy will likely happen through adjustments in money demand – or said in another way the market will implement the policy. Or that will at least be the case if the regime is credible. Lets first look at a credible fixed exchange regime and lets say that for some reason the exchange rate is pushed away from the central bank’s exchange rate target so the actual exchange rate is stronger than the targeted rate. If the target is credible market participants will know that the central bank will act – intervene in the currency market to sell the currency – so to ensure that in the “next period” the exchange rate will be back at the targeted rate. As market participants realize this they will reduce their currency holdings and that in itself will push back the exchange rate to the targeted level. Hence, under 100% credibility of the fixed exchange rate regime the central bank will actually not need to do any intervention to ensure that the peg is kept in place – there will be no need to change the currency reserve/money base. The market will effectively ensure that the pegged is maintained. The mechanism is very much the same in a regime where the central bank targets the market’s inflation expectations. Lets again assume that the regime is fully credible. Lets say that the central bank targets 2% inflation (expectations) and lets assume that for some reason a shock has pushes inflation expectations above the 2%. This should cause the central bank to automatically reduce the money base until inflation expectations have been pushed back to 2%. However, as market participants realize this they will also realize that the value of money (the inverse of the price level) will increase – as the central bank is expected to reduce the money base. This will cause market participants to increase money demand. For a given money base this will in itself push down inflation until the 2% inflation expectations target is meet. Hence, under full credibility the central bank would not have to do a lot to implement its target – either a fixed exchange rate target or a Hetzel style target – the markets would basically take care of everything and the implementation of the target would happen through shifts in money demand rather than in the money base. That said, it should of course be noted that it is exactly because the central bank has full control of the money base and can always increase or decrease it as much as it wants that the money demand taking care of the actual “lifting” so the central bank don’t actually have to do much in terms of changing the money base. This basically means that the money base will remain quite stable while the broad money supply/demand will fluctuate – maybe a lot – as will money-velocity. Hence, under a credible Hetzel style regime there will be a lot of nominal stability, but it will look quite non-monetarist if one think of monetarism of an idea to keep money supply growth stable. Obviously there is nothing non-monetarist about ensuring a stable nominal anchor. The anchor is just different from what Friedman – originally – suggested. Effectively during the Great Moderation – or at least since the introduction of TIPS in 1997 – the world increasingly started to look as if the Federal Reserve actually had introduced Bob’s proposal and targeted break-even inflation expectations (around 2.5%). The graph below illustrates this. The graph shows that from 2004 to 2008 we see that the 5-year “break-even” inflation rate fluctuated between 2 and 3%. 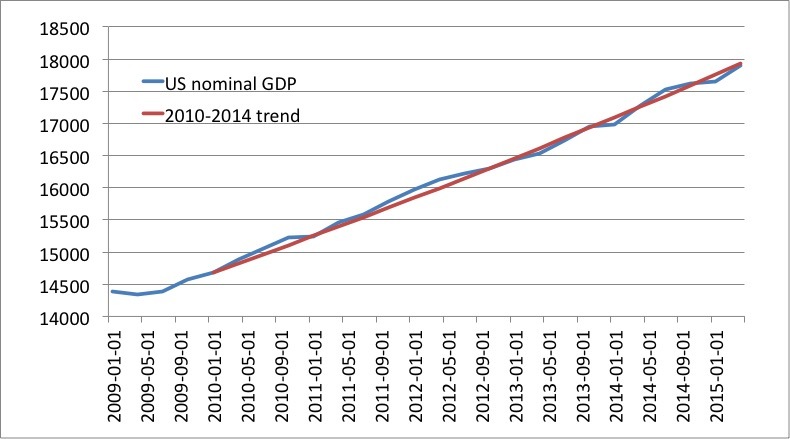 We could also note that we during that period also saw a remarkable stable growth in nominal GDP growth. In that sense we can say that monetary policy was credible as it ensured nominal stability – defined as stable inflation expectations. 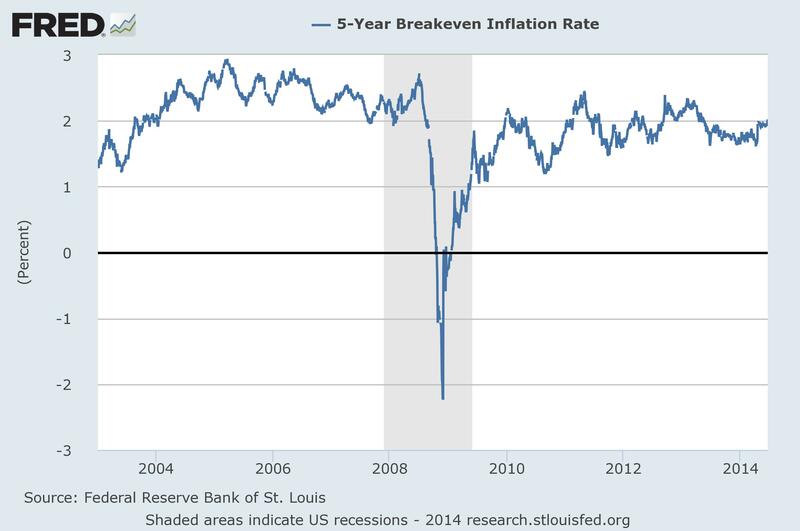 However, in 2008 “something” happened and break-even inflation expectations collapsed. Said, in another way – the Fed’s credibility broke down. The markets no longer believed that the Fed would be able to keep inflation at 2.5% going forward. Afterwards, however, one should also acknowledge that some credibility has returned as break-even inflation particularly since 2011 has been very stable around 2%. This by the way is contrary to the ECB – as euro zone break-even inflation on most time horizons is well-below the ECB’s official 2% inflation target. While most observers have been arguing that the “something”, which happened was the financial crisis and more specifically the collapse of Lehman Brothers Market Monetarists – and Bob Hetzel – have argued that what really happened was a significant monetary contraction and this is very clearly illustrated by the collapse in inflation expectations in 2008. Now imagine what would have happened if the Fed had implemented what I above called the strict version of Bob’s proposal prior to the collapse of Lehman Brother. And now lets say that Lehman Brothers collapses (out of the blue). Such a shock likely would cause a significant decline in the money-multiplier and a sharp decline in the broad money supply and likely also a sharp rise in money demand as investors run away from risky assets. This shock on its own is strongly deflationary – and if the shock is big enough this potentially could give a shock to the Fed’s credibility and therefore we initially could see inflation expectations drop sharply as we actually saw in 2008. However, had Bob’s regime been in place then the Fed would automatically have moved into action (not in a discretionary fashion, but following the rule). There would not have been any discussion within the FOMC whether to ease monetary policy or not. In fact there would not be a need for a FOMC at all – monetary policy would be 100% automatic. Hence, as the shock hits and inflation expectations drop the Fed would automatically – given the rule to target for example 2.5% break-even inflation expectations – increase the money base as much as necessary to keep inflation expectations at 2.5%. This would effectively have meant that the monetary consequences of Lehman Brothers’ collapse would have been very limited and the macroeconomic contraction therefore would have been much, much smaller and we would very likely not have had a Great Recession. In a later blog post I will return to Bob’s explanation for the Great Recession, but as this discussion illustrates it should be very clear that Bob – as I do – strongly believe that the core problem was monetary disorder rather than market failure. There is no doubt in my mind that the conduct of monetary policy would be much better if it was implemented within a market-based set-up as suggested by Robert Hetzel than when monetary policy is left to discretionary decisions. That said as other Market Monetarists and I have argued that central banks in general should target the nominal GDP level rather than expected inflation as originally suggested by Bob. This means that we – the Market Monetarists – believe that governments should issue NGDP-linked bonds and that central banks should use NGDP expectations calculated from the pricing of these bonds. Of course that means that the target is slightly different than what Bob originally suggested, but the method is exactly the same and the overall outcome will likely be very similar whether one or the other target is chosen if implemented in the strict version, where the central bank effectively would be replaced by a “computer” (the market). In the coming days and weeks I will continue my celebration of Robert Hetzel. In my next Hetzel-post I will look at “Bob’s model” and I will try to explain how Bob makes us understand the modern world within a quantity theoretical framework. PS I should say that Bob is not the only economist to have suggested using markets and market expectations to implement monetary policy and to ensure nominal stability. I would particularly highlight the proposals of Irving Fisher (the Compensated Dollar Plan), Earl Thompson (nominal wage targeting “The Perfect Monetary System”) and of course Scott Sumner (NGDP targeting). The ECB is today widely expected to introduce a number of measures to ease monetary conditions in the euro zone and it seems like the ECB is finally beginning to recognize the serious deflationary risks facing the euro zone. But how far behind the curve is the ECB? There are a lot of measures of that, but if we look at the ECB’s own stated goal of 2% inflation then we will see that the ECB has basically failed consistently since 2008. Below I look at the the level of the GDP deflator (which I believe is a better indicator of inflation than the ECB’s prefered measure – the HCIP inflation). 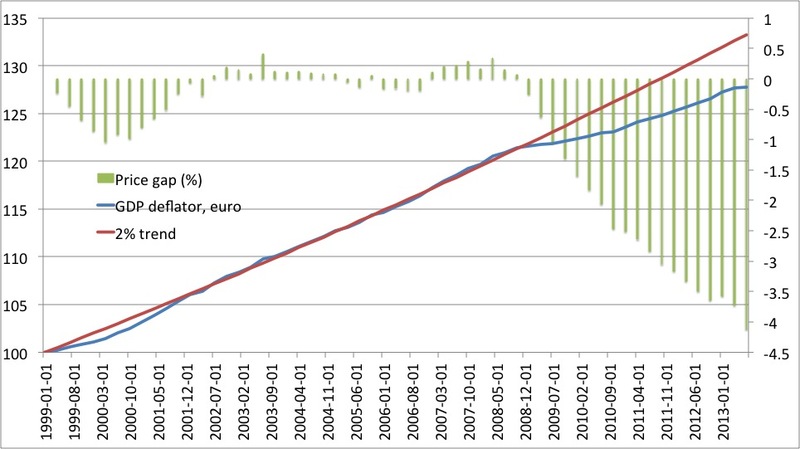 I think the graph very well illustrates just how big the ECB’s policy failure has been since 2008. From 1999 to 2008 the ECB basically kept the actual price level on a straight 2% path in line with its stated policy goal. However, since 2008 GDP deflator-inflation has consistently been well-below the 2%. As a result what I here call the price gap – the percentage difference between the actual price level and the 2% path – has kept on widening so the gap today is around 4%. This is a massive policy mistake – and this is why the euro zone remains in crisis – and given the fact that we are basically not seeing any broad money supply growth at the moment the price gap is very likely to continue to widen. In fact outright deflation seems very likely if the ECB once again fails to take decisive action. At the ECB in Frankfurt they are happy to repeat Milton Friedman’s dictum that inflation is always and everywhere a monetary phenomenon. So it should be really simple – if you have less than 2% inflation and want to ensure 2% inflation then you need to create more money. Unfortunately the ECB seems to think that it is in someway ‘dirty’ to create money and therefore we are unlikely to see any measures today to actually create money. Most analysts expect a cut in ECB’s deposit rate to negative territory and maybe a new LTRO and even some kind of lending scheme to European SMEs. But all of that is basically credit policies and not monetary policy. Credit policy has the purpose of distorting market prices – and that shouldn’t really be the business of central banks – while monetary policy is about hitting nominal variables such as the price level or nominal spending by controlling the money base (money creation). The ECB needs to stop worrying about credit markets and instead focus on ensuring nominal stability. So to me it is very simple. Today Mario Draghi simply should announce that the ECB has failed since 2008, but that that will now change. He should pre-commit to bringing back the price level to the ‘old’ trend within the next two years and do that he should keep expanding the euro zone money base (by buying a basket of GDP weight euro zone government bonds) until he achieves that goal and he should make is completely clear that there will be no limits to the expansion of the money base. The sole purpose of his actions will be to ensure that the price level is brought back on track as fast as possible. Once the price level is brought back to the old trend it should be kept on this 2% trend path. PS Yes, I fundamentally would like the ECB to target the nominal GDP level, but targeting the GDP deflator price level would be pretty close to my preferred policy.